Filled with charm, action and irreverent humor this original story features characters, locations and vehicles across the entire LEGO Star Wars universe including Darth Vader, Luke Skywalker, Han Solo, Princess Leia, C-3P0, R2-D2, Darth Maul, and more. SAN FRANCISCO, Calif. (January 22, 2013) - After a record breaking debut on Cartoon Network, The LEGO Group and Lucasfilm announced today that Star Wars Lego: The Empire Strikes Out will release on DVD this coming March 26, 2013. The 22-minute original standalone special will bring the same tongue-and-cheek humor fans know and love in a brand new epic adventure featuring everyone's favorite LEGO Star Wars characters. Distributed by Twentieth Century Fox Home Entertainment, the DVD will include an exclusive collectible Darth Vader LEGO minifigure and is available now for preorder at www.foxconnect.com/awesome. 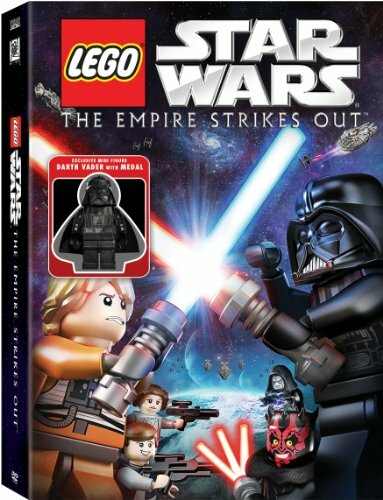 Filled with charm, action and irreverent humor this original story features characters, locations and vehicles across the entire LEGO Star Wars universe including Darth Vader, Luke Skywalker, Han Solo, Princess Leia, C-3P0, R2-D2, Darth Maul, and more. When the premiere of Star Wars Lego: The Empire Strikes Out aired on Cartoon Network, it became the number-one telecast of the day with kids ages 6-11 and boys ages 2-17. Written by Emmy Award winner Michael Price (The Simpsons), the show features many of the beloved Star Wars voice-actors fans know and love including Anthony Daniels, Sam Witwer, Ahmed Best and more. HOLD ON TO YOUR BRICKS....FOR AN ALL-NEW ANIMATED ADVENTURE! Your favorite characters are back to save the galaxy in Star Wars Lego: The Empire Strikes Out . The heroes of the Rebel Alliance including heroic Luke Skywalker, swaggering Han Solo and steadfast Princess Leia have no time to celebrate their victory over the Empire as a new Imperial threat arises. But as Jedi-in training Luke embarks on this next mission, he discovers that his celebrity status as a "Death-Star-Blower-Upper" can be a double-edged lightsaber when he's constantly mobbed by crazed fans. So much for secret missions! Meanwhile, Darth Vader and Darth Maul are locked in a hilarious "Sith-ling" rivalry as they compete for the Emperor's approval. It's an action-packed comic adventure that's out of this world! Lucasfilm, Star Wars and related properties are trademarks and/or copyrights, in the United States and other countries, of Lucasfilm Ltd. and/or its affiliates. TM & (c) Lucasfilm Ltd. All rights reserved. All other trademarks and trade names are properties of their respective owners. LEGO, the LEGO logo, the Brick & Knob configurations and the Minifigure are trademarks of The LEGO Group. (c)2013 The LEGO Group. All rights reserved. Twentieth Century Fox Home Entertainment, LLC (TCFHE) is a recognized global industry leader and a subsidiary of Twentieth Century Fox Film, a News Corporation company. Representing over 75 years of innovative and award-winning filmmaking from Twentieth Century Fox, TCFHE is the worldwide marketing, sales and distribution company for all Fox film and television programming, acquisitions and original productions as well as all third party distribution partners on DVD, Blu-ray(TM), Digital Copy, Digital HD(TM), and VOD (video-on-demand). Each year TCFHE introduces hundreds of new and newly enhanced products, which it services to retail outlets from mass merchants and warehouse clubs to specialty stores and e-commerce throughout the world. The LEGO Group (www.LEGO.com) is a privately held, family-owned company, based in Billund, Denmark. It was founded in 1932 and today the group is one of the world's leading manufacturers of play materials for children. The company is committed to the development of children's creative and imaginative abilities through its products, which can be purchased in more than 130 countries. Visit www.LEGO.com.